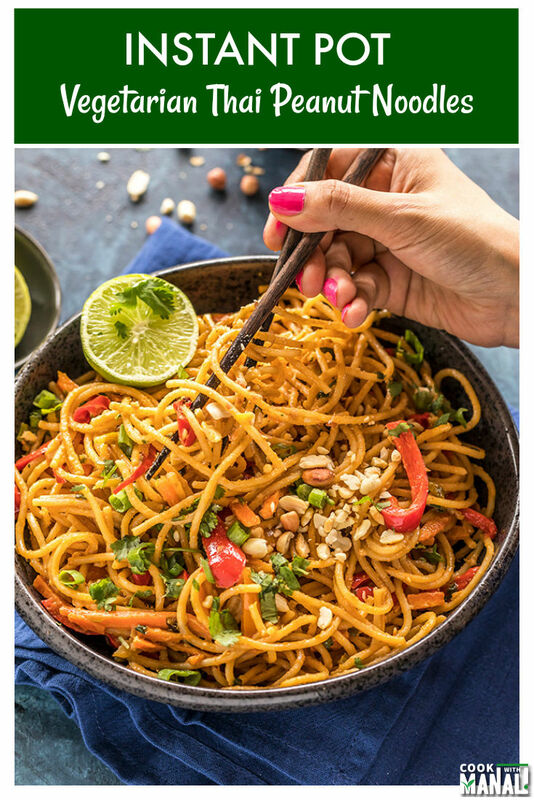 Instant Pot Thai Peanut Noodles – easy one-pot vegetarian weeknight meal which gets done in less than 30 minutes! One of the cuisines that I actually liked after moving to US was Thai. My exposure to different kind of food/cuisine in India was limited. I hardly ever ate anything other than Indian. 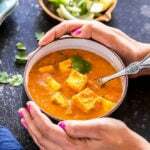 We grew up eating homemade food everyday and it was always Indian – the same dal, rice, sabzi (veggie) and roti. That’s pretty much all I ate for lunch and dinner. When I moved to US, I was exposed to an array of flavors. These flavors were so different and I had never tasted them before. I tried a lot of new food, some which I didn’t like at all and some I loved like Thai food! Do you guys love thai food? I think its so flavorful and its hard not to like it. While I love eating it out, I often make it at home too. 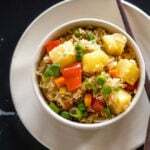 You guys quite like my Instant Pot Thai Tofu Pineapple Curry recipe and so I thought it was about time, I shared another one! 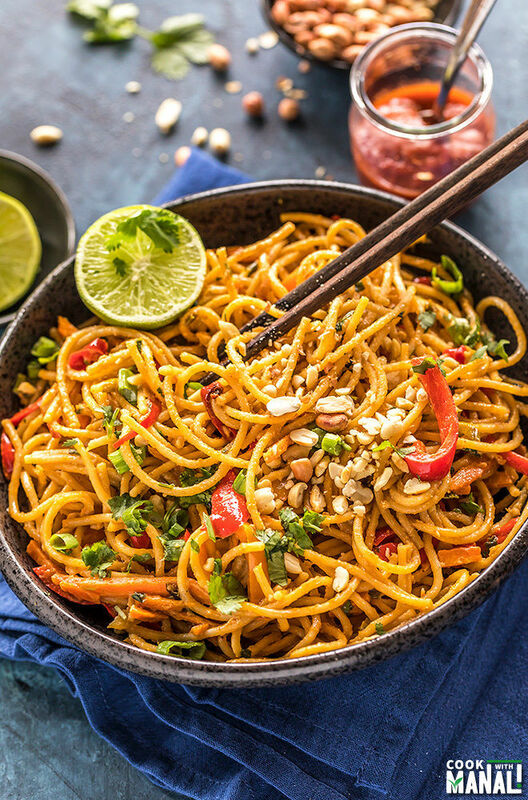 These Instant Pot Thai Peanut Noddles are so easy to make in the IP. It’s a one pot meal which you can put on the table in less than 30 minutes! 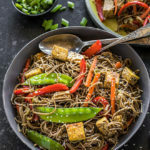 What makes these Instant Pot Thai Peanut Noodles special? ✓ these get done in one pot – no need to cook the noodles separately. ✓ one pot means less dirty dishes! ✓ gets done in less than 30 minutes! ✓ perfect meal for those busy nights. ✓ packed with flavors, there’s soy sauce, honey, peanut butter, sriracha and rice vinegar in there. ✓ make it vegan be replacing the honey with brown sugar or any other vegan friendly sweetener. 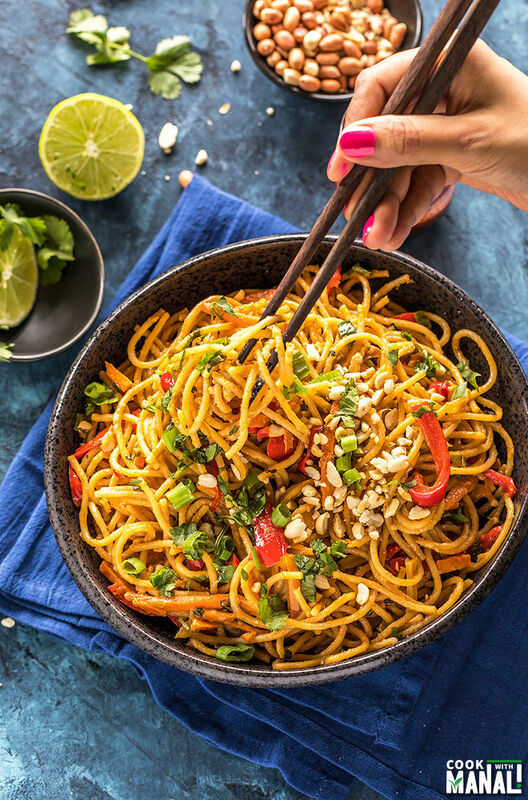 To make these instant pot thai peanut noodles, all you need is to chop the ginger, garlic, pepper, carrot and green onion. Once you have these chopped, it only takes 5 minutes to put it all in the pot and then let the IP do its thing. You may also add tofu to these noodles to make the meal protein-rich. Sarvesh is not very fond of tofu and hence I skipped that part. We add uncooked spaghetti to the Instant Pot along with the veggies and sauce and it all gets perfectly cooked. Isn’t that amazing? Seriously I can’t get over the fact that I don’t have to boil the noodles separately. And they get perfectly cooked, not soggy at all. In fact the spaghetti was al-dente which means that it had a nice bite to it. If you prefer softer noodles, then you may increase the cooking time by couple of minutes. This was perfect for me. 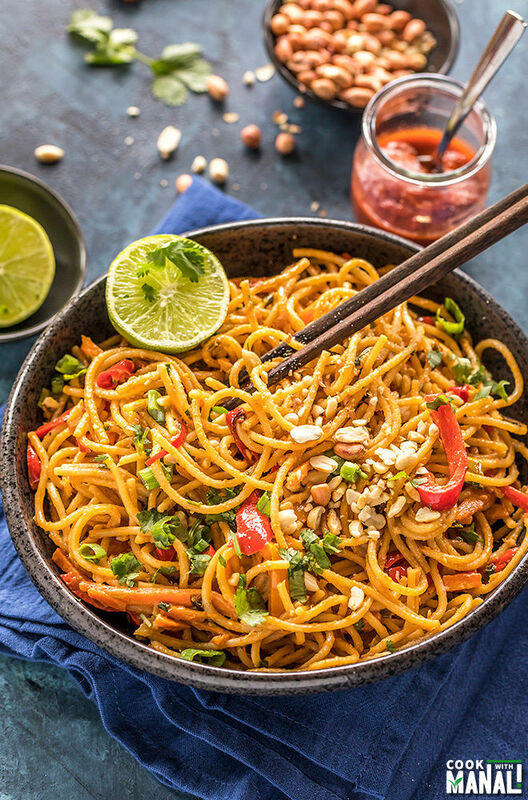 The garnishes add more flavor to these thai peanut noodles. So don’t forget to add in lots of chopped cilantro, lime juice and crushed peanuts! If you have never made noodles/spaghetti in your Instant Pot, now is the time! And this is the easiest recipe to start with. I am sure once you make it, you will be amazed how easy it really was. Hope you guys enjoy this one! Press the saute button on your Instant Pot. Once it displays hot, add oil and then add the minced garlic and ginger. Saute for a minute until garlic and ginger start changing color. Add in the veggies – carrots, pepper and green onion and toss to combine. You may reserve some spring onion greens for garnish. Push veggies to the side and to the center of the pot add the soy sauce, rice vinegar, honey, sriracha, peanut butter and salt. Whisk to combine the sauce. You may also combine the sauce beforehand in a bowl. Break spaghetti into half and then add to the pot. Add water until spaghetti is just covered. You may press the noodles slightly with a spatula so that noodles on top get slightly under water. Close the pot with its lid. Press the manual or pressure cook button and cook on high pressure for 4 minutes. The pressure valve should be in the sealing position. Do a quick pressure release. Open the pot, use a tong to mix the sauce, noodles and veggies together. Add reserved green onion greens, juice of 1 lime and cilantro. 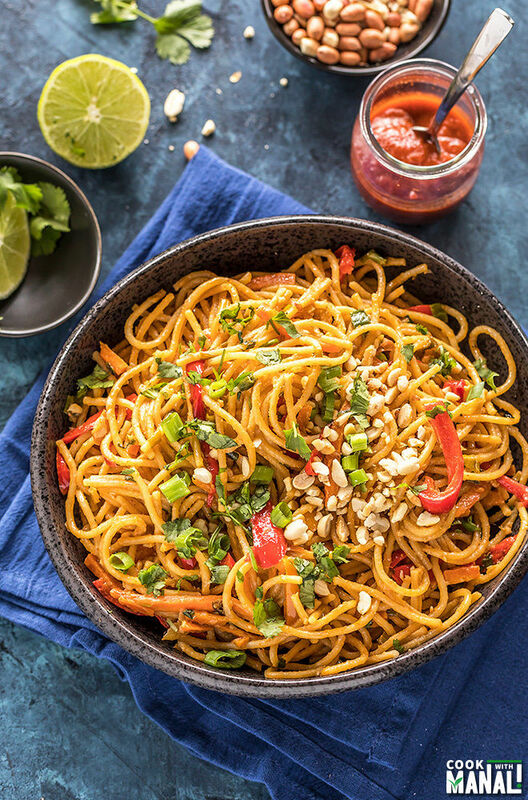 Serve these instant pot thai peanut noodles with crushed peanuts on top. 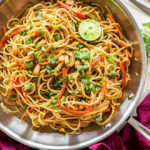 Thai Peanut Noodles made in the Instant Pot! Easy one-pot weeknight meal which gets done in less than 30 minutes! Add in the veggies - carrots, pepper and green onion and toss to combine. You may reserve some spring onion greens for garnish. Break spaghetti into half and then add to the pot. Add water until spaghetti is just covered. You may press the noodles slightly with a spatula so that noodles on top get slightly under water. Add reserved green onion greens, juice of 1 lime and cilantro. Serve the noodles with crushed peanuts on top! The noodles will look little watery when you open the pot but soak the sauce pretty quickly. Adjust sriracha and honey to taste. If you like spicy noodles, add more of sriracha. Thank you! Looks yummy. How will i elevate this for 4 people? Which ingredient’s quantity will i change and by how much? I would say double the ingredients and cook for an additional 1-2 minute? Glad to hear you like this recipe. Hmm lot of IPs are prone to showing the burn notice, especially the newer models..do you have a newer model 8 qt? If it shows burn for a lot of things, I would contact the customer care. Make sure that there’s nothing stuck at the bottom before you put on the lid. Deglaze the pot and then put on the lid. It should come to pressure. I had both of my old model IP break and now both the new models show the burn notice a TON it makes me mad bc most times it’s not even stuck, these new models do not like any type of thick sauce but I noticed that if I left it on the burn notice it corrected itself. that’s the problem with newer models unfortunately.. I too love Thai food! Your peanut noodles look so appetizing! Wow, I can’t imagine the experience of moving to entirely new country…especially a new country where the foods are so different than what you’re used to. In general, I feel like the US really is a melting pot of flavors, though. 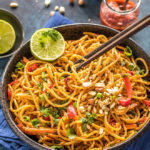 I personally love thai peanut flavors, and these noodles are just calling to me for dinner tonight! They look delicious, Manali! 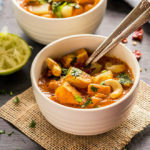 Thai peanut is one of my favorite things ever and I love that this is made in the Instant Pot! Can’t wait to try this! 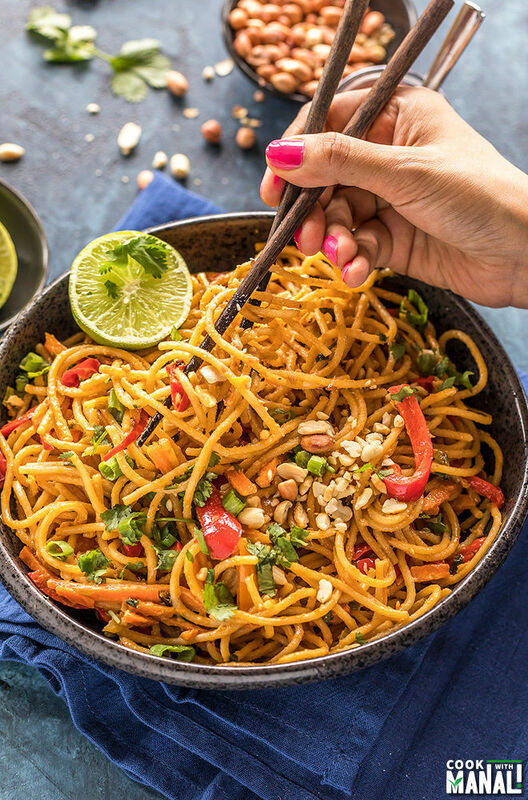 These peanut noodles seriously look SO amazing, Manali! I love so much that they’re made in the instant pot!! This was really fun to make and yummy! I doubled the recipe, just put enough water to cover the noodles once I pressed them down. Cooked for 6 minutes; 5 probably would have been fine. I also added cooked, chopped chicken at the end because my husband doesn’t think it’s a meal without meat 😊. I’ve never made Thai food before and this was a great way to begin. Thanks! Made this tonight and it was excellent! I added a little extra water to cover the spaghetti since it didn’t seem like enough. 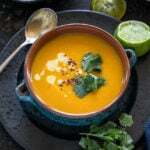 After cooking, it thickened up perfectly and tasted great with the peanuts, cilantro and lime. This one is a keeper! Can I use rice noodles with this recipe? Same cooking time? I am not sure if that would work. I have tested this recipe with regular spaghetti only.. I used rice noodles I think next time I’ll reduce cooking time to 2-3 minutes total. My brown rice noodles were a little over-cooked. Also, once I set the timer on it, the count down disappeared and I felt like it cooked too long, but its still delicious! It’s so delicious!! I love it! I used rice noodles-I think next time I’ll reduce cooking time to 2-3 minutes total. My brown rice noodles were a little over-cooked but I knew I was a possibility. glad you liked it Neela..yes rice noodles might need less time. I have not tested this recipe with rice noodles. I cooked my noodles for 5 Minutes. They were gummy so I’m assuming I overcooked them. I’ll try four minutes next time. Otherwise it was an awesome recipe. I followed the recipe exact ….except[lol] omitted the coriander. If you have an IP you have to make tnis recipe. It is delish! carnivore hubby gave it a two thumbs up K! I subbed low-sodium veggie broth for the water and used rice noodles instead of spaghetti. It was so flavorful and amazing! (My husband inhaled it!) Next time I’ll do 3 minutes instead of 4, since the noodles were a little gummy, but it was still delicious and will now be a staple. Thanks for a great recipe! Hi Erinn, I am glad you liked the recipe, yay! 🙂 I have only tested this recipe with regular spaghetti, so I can’t say about the rice noodles but assuming they would need lesser time! 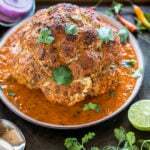 I’ve made this recipe twice and love it! I shared it with a friend & it inspired her to buy a multi cooker. I never dreamed I could make Thai peanut noodles with simple fresh ingredients I already had on hand. Flavorful and definitely not boring! And to think I was kinda indifferent about my InstantPot before this recipe! I’d found many main dish recipes I prepared in it to be bland and forgettable. Thank you for sharing your secrets with those of us who were lukewarm about multi cookers! this is one of the sweetest and most encouraging comments ever!Thank you Jill…I am glad I could inspire you to like your IP! Made this for lunch today using Banza chickpea pasta. Turned out great! Thanks for sharing. I am not sure,you can try cutting down the ingredients to half but the water might be less for the pot to come to pressure then. I would add along with the veggies! Two weeks ago I made this recipe exactly as written. It was amazing! Tonight I made it on the stove top with sweet potato and zucchini zoodles instead of wheat noodles. Absolutely 5 stars! Will repeat make this frequently. I am glad you enjoy this recipe Carla! 🙂 Bet it tasted great with sweet potatoes, yum! Worked out great!!! Family loved it. Has anyone tried it with thin spaghetti noodles? I will try, and cook no longer than 4 minutes and see how they turn out! Is the red pepper you used a hot or sweet pepper? I have only cooked with bell peppers so thought I’d better ask. Thanks for the help! the red pepper is sweet! The Thai peanut noodles turned out great! They were delicious. Thanks for another great recipe and thanks for the help! you are welcome Cindy 🙂 I am glad to know you enjoyed the noodles! I doubled the recipe (4 family members) and cooked for 6 minutes. I think next time I will only cook for 4-5 minutes. The spaghetti was a little overcooked. next time I make this, I will cook pasta without veggies. We like crunchy veg, so I will steam and toss them in at the end. Also, I will up the spice level. Great flavors and easy to make in the IP. I am a newbit to the IP. I am going to try this recipe in my new 6 qt. Instant Pot. I am thinking of adding some small strips of chicken breast and then saute with the veggies. Do you think it will alter the cooking time significantly if I add the chicken? My plan is to keep the chicken on the bottom of the pot with the veggies. Thanks for the great recipe. Hi Barbara, I am afraid I can’t help you with this. I am a vegetarian and have never cooked chicken in my life. So, I don’t know if the chicken would cook in that much time in the IP. Thanks for your reply and helpful link. My apologies to you, I didn’t know you are a vegetarian. Thank you for posting in the IP Community! I recently discovered Thai food and peanut sauce. Can’t wait to try this! Hi Manali, I made your recipe tonight and followed the instructions exactly as written. It turned out to be a glob of noodles. I wondered if it mattered that I used gluten free noodles. We still ate the glob of noodles and it was very tasty. Hi Chris, I always request to follow the recipes exactly..I test them several times before sharing on the blog. I have tried and tested this recipe with regular spaghetti only, it comes out perfect each time. And this recipe has been made by so many of my readers with much success. Because you used gluten free noodles, the results will be different. Glad they were still tasty though.. This was the very first thing I cooked in my Instant Pot and it was delicious! After 4 minutes the spaghetti still wasn’t cooked so I added a little bit more water and cooked for an additional 2 minutes and it was perfect! I must have done something wrong because I got a burn notice, but everything on top that I could save was delicious!! hmm the newer models are having this problem a lot. I will just make sure there’s nothing stuck at the bottom before closing the pot. Looks yummy! I have a similar recipe that uses fettuccine. How long would I cook that pasta and would I use more water? I have never cooked fettuccine in my IP but I would probably do 6-7 minutes on high pressure and a quick pressure release. I would keep the amount of water/broth same as this recipe. I made this tonight and, although the flavor was delicious, the texture was gummy. Is there a way to improve the texture? If you do not like the texture of the veggies, maybe add them at the end once noodles are cooked. Simply toss veggies at the end, cover with a glass lid for 2-3 minutes. They will remain crunchy that way! I didn’t have good luck with this recipe. After the vegetables were stir-fried, cooking them for 4 minutes on pressure turned them into mush. And when I opened the instant pot, the noodles were glued together in clumps. The flavor was good, but if I make this again, I’ll remove the veg before adding the noodles and sauce ingredients, then add them back in after the pressure cooking is done. I also made some crispy tofu and added that in after it was all cooked. Not sure what went wrong, sorry it didn’t work out for you. Did you use regular spaghetti noodles? The recipe doesn’t call for you to stir fry the vegetables, but just to throw them in raw with the other ingredients after you’ve sautéed the garlic/ginger and set it to pressure cook. THIS WAS INCREDIBLE!! I’m new to Instant Pot..so happy I found this recipe! Next time I might add one or two more minutes. Most of the noodles were perfect but a few were a little clumpy still. Thanks for a great recipe! yay! It’s one of my favorite recipes too! This is amazing! I’m not a big Thai food person, but my daughter is vegan (I left out the honey) and I like trying new recipes for her. Everyone in the family loved this! So easy, and so good! Will be one of my go-to recipes! I would recommend mixing the sauce well beforehand. I whisked it in the pot but it might not have been perfectly mixed because I got the burn notice. It works fine if you mix the sauce in the pot, so many people have successfully made it this way. This burn issue is a problem with the newer IP models especially 8qt. This was a big hit with my family – kids and adults alike. I doubled everything except the sriracha (kids don’t like spicy – hubby and I just added more to our own) and cooked for 5 minutes with quick release. Pasta came out perfectly. I needed 3 and 3/4 cups of water to cover the pasta. I followed the instructions and pushed the veg to the side and mixed the sauce in the pot – which worked out well because my peanut butter had been in the fridge and was too hard to mix without the heat. The cilantro and lime are a must to finish this off with and give it a bit of zing. Thank you for the recipe. I will definitely make it again. I might add some tofu next time as I tend to need a lot of protein to keep me from snacking at night. Hi! I have made this one like 3 times or so since I first discovered it and love it!!! I owe you an apology, though, because I’ve always added cooked chicken to it. I have nothing against veggies at all!!! It so reminds me of those noodle bowls you can get in the International aisle at the store for less money and lots more of the good stuff! I will make this one for the rest of my life, that’s for sure! Thank you so much for your recipes!!! I know I’ll find others beside this one and the Mexican Rice recipe I started my only day off with in my kitchen! Just a clarification! I see that I may have sounded misleading about something! Your recipe is the one that was cheaper to make and had lots more of the good stuff, not the tiny bowls in the store!!! Sorry about that!!! This is SO GOOD! I added tempeh, which went wonderfully with it. I sauteed it with the ginger and garlic in the beginning with a bit of extra oil. I also added a bit of extra water to compensate for the added mass of the tempeh. I made this last night, had a second helping, and today a friend came over and we ended up finishing off the rest of it. I wanted more leftovers so I’m going to make it again tomorrow, haha. Do the noodles need to be submerged? Mine were nowhere close with the suggested amount of water…. Just made this for the first time, the flavor of this dish is amazing! My sauce was a bit gummy, do you have any suggestions for the next time I cook this dish? I followed the directions and exactly so I’m not sure what happened. 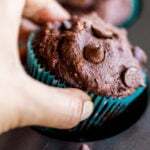 Great recipe for an IP newbie! I used my leftover veggies- peas, carrots, and whole wheat spaghetti. My toddler loved it (I left out the sriracha)!